The largest urban centre in the northern Netherlands, Groningen is an ancient city with a young heart, thanks to its large student population. Its status as a major Dutch educational centre has imbued Groningen with a vibrant arts scene, lively nightlife and a wealth of fascinating museums covering various topics from history, science to comics, and even tobacco. Old and new blend well in this city, which dates from the third century, but had to be largely reconstructed after bombing in World War II. Nevertheless, attractions are far from few in the city. Through the centre of town runs the Herestraat, a wide pedestrian avenue packed with big-name stores. Radiating out from the main street are narrow roads lined with small shops selling local goods and crafts, interspersed with bars, cafes and restaurants. 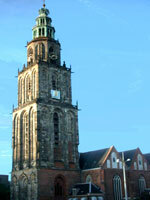 The city's landmark building is the Martini Tower, adjoining a church on the main square (Grote Markt), which can be climbed to afford a spectacular view across the city. Its most architecturally notable building, however, is the city theatre (Stadsschouwburg), a pink Renaissance concoction with a unique ornate interior, which is as worth seeing as the productions which take place on its stage. Visitors can also visit a number of medieval almshouses, which still function today as homes for seniors and the poor. Art pervades the city, even in the train station with its magnificent stained glass windows; but not to be missed for art-lovers is the renowned Groningen Museum opposite the station, which houses a permanent collection of 17th-century works (including Rubens' Adoration of the Magi), Hague School paintings, ceramics, and works by Groningen's expressionist De Ploeg group. Groningen is a pretty city, with a number of parks and gardens to relax in on beautiful days. The Renaissance-style Prinsenhof Garden, open from April to October, has lovely topiaries that have been sculpted for over 250 years. With plenty to do and see, and easily accessible by air or train, Groningen has become a firm favourite with visitors seeking to stray beyond the traditional Dutch tourist destinations. We are looking for contributors for our Groningen travel guide. If you are a local, a regular traveller to Groningen or a travel professional with time to contribute and answer occasional forum questions, please contact us.